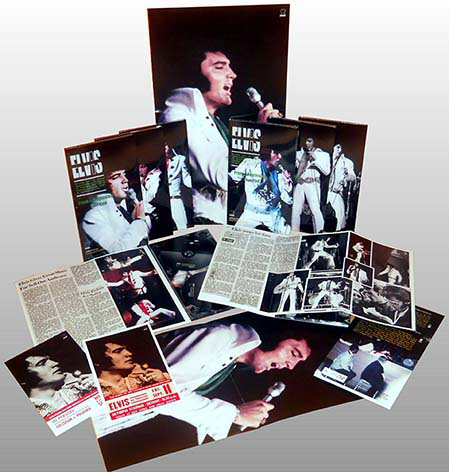 To be released soon, From The Beginning To The End (SR Records) with focus on Elvis’ first September 1970 tour, featuring the opening show of the tour in Phoenix September 09th and the closing show of the Tour in Mobile September 14th, 1970. Both the shows are previously unreleased taken directly from a first generation tape. The SR attitude is to present Elvis at the peak of his possibility and without the doubt in the Elvis’ first Tour in the seventies present Elvis at the top of his possibilities, delivering maybe shorter shows respect the previous summer seasons, but still solid. If Rock is attitude the man still has it. The performances are terrific rough and sharp. Here are presented two unreleased shows from the September tour. Both the show are very similar, the track list is minimized and the shows are practically identical, with the exception of Bridge Over Troubled Water and Funny How Time Slips included in the final Show of Mobile.. They are happy and proud of the result we hope you can enjoy too, in spite of the limitation of the audience recording, we are talking of a big Arena shows no of the intimate Las Vegas showroom. The shows are fantastic and the track listing is solid, Elvis is delivering us a sort of greatest hits. Starting from his latest single I’ve Lost You then with the more successful The Wonder Of You, passing to the two best singles of 1969, In The Ghetto and Suspicious Minds without forgetting the glorious fifties with Heartbreak Hotel and Hound Dog…. All the songs are very well performed. This new SR special Product will be housed in a deluxe LONG DIGIPACK, containing a 6 pages of foldout booklet with focus and details on the tour including a collection of live photographs newspapers clips and memorabilia plus a high quality glossy 135 gram paper poster of 50x26 cm size and a high glossy paper bonus art card of 25x13 cm of size..
As tradition of the label, SR LABEL DECIDED TO PRODUCE TOGETHER THE 420 copies of STANDARD EDITION A LIMITED DELUXE EDITION of 80 copies WITH EXCLUSIVE CONTENTS. Good shows...problem will be the sound ..I am afraid...SR isnt known of putting much efforts there..more just copy from what we have on cd-r.